Sage Gardeners, a non-profit 501(c)3 organization, is dedicated to improving the quality life for our aging ranchers, farmers and gardeners in Montana. We realize that many older adults are no longer feeling the dirt in their hands and have reluctantly given up on a favorite pastime because they have had to relocate to smaller/more easily manageable living spaces. Older adults, who live in their own homes, find it very difficult to garden in-ground, therefore discontinuing their gardening. 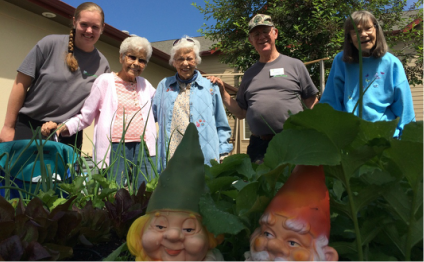 Our mission is to reconnect these aging seniors to their gardening roots building one accessible garden at a time. Many studies have been done on healing environments and elderly. Through these studies, they have found both psychological and physical benefits from incorporating natural environs, ie gardens, into people’s lives. Sage Gardeners works hard to bring these beneficial activities into their lives to help improve their quality of life: mentally, socially, and physically. 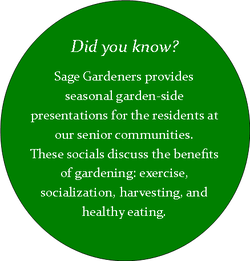 Founded in 2010 by master gardener, Jonquil Nelson, Sage Gardeners set out with a plan: reconnect seniors to their gardening roots. Jonquil (johni), Sage Gardeners' founder and executive director, does exactly that in many towns across Montana. 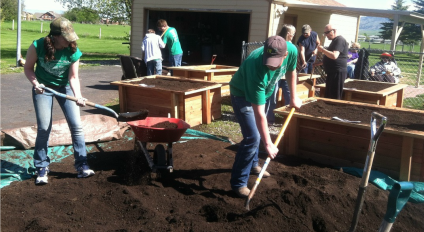 With the help from numerous volunteers, master gardener students, and Montana State University students, Sage Gardeners has built gardens in several retirement, assisted living, skilled nursing, cancer and veteran support communities, and affordable housing complexes, as well as provided raised gardens beds to over 75 seniors in private residences. Many more eager seniors are awaiting beds for 2018! Our vision is to make vegetable gardening accessible to all seniors. We want to provide accessible, raised, organic vegetable gardens and horticultural therapy to senior communities such as assisted living facilities, retirement communities, affordable senior housing, community open spaces, veteran homes, specialized care communities, and private residences. In addition to building new gardens each year, our ever-growing maintenance program provides services to each and every garden from the past year's recipients. We tailor our gardens and services to each individual and retirement community's needs and abilities.